Another nice podcast to get yourself into! Critiques and well-informed blather from a Laurel & Hardy enthusiast. A review of the new docu-drama starring Steve Coogan and John C. Reilly as "The Boys." Our final podcast episode. Thanks to all of our listeners! An overview of Laurel & Hardy's final Big Studio feature films. Steve Bailey offers up a recipe for a delicious, Laurel & Hardy-themed dessert. Steve Bailey discusses eight foreign-language versions that Laurel & Hardy made of their American talkies. Steve Bailey discusses Laurel & Hardy's guest appearances in short subjects starring Thelma Todd & ZaSu Pitts, Our Gang, and Charlie Chase. Steve Bailey pays tribute to Marvin Hatley and Leroy Shield, the film-score composers at the Hal Roach Studios. Overviews of the Laurel & Hardy short subjects NIGHT OWLS and SCRAM! Steve Bailey discusses Laurel & Hardy's dual roles in the short subjects BRATS and TWICE TWO, and the feature film OUR RELATIONS. Steve Bailey critiques Laurel & Hardy's early talkie short subjects UNACCUSTOMED AS WE ARE, THEY GO BOOM!, BERTH MARKS, THE HOOSE-GOW, and MEN O' WAR. 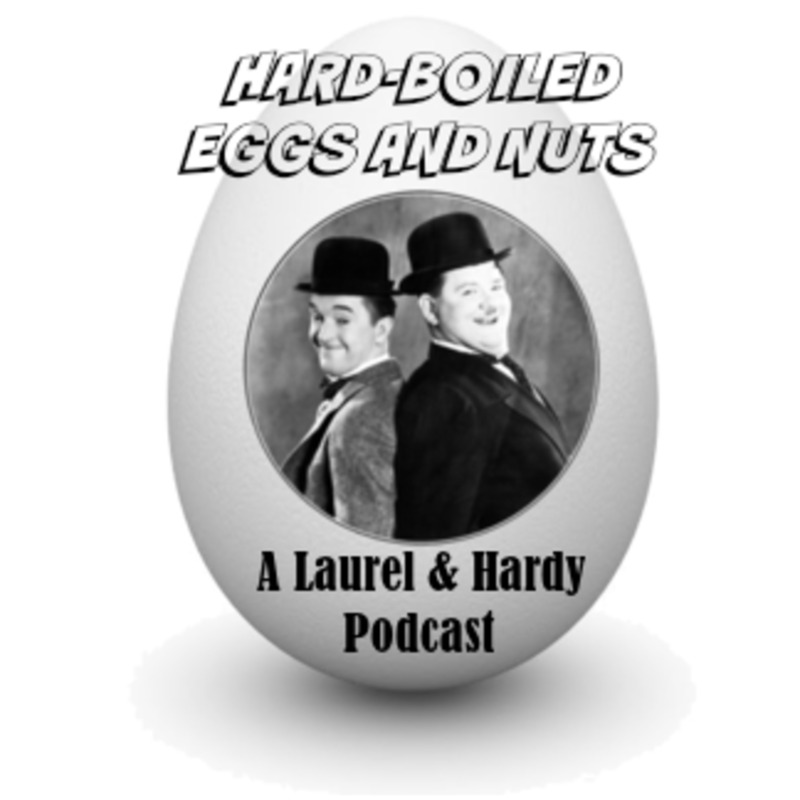 Steve Bailey reviews the L&H silent short subjects CALL OF THE CUCKOO, THE FINISHING TOUCH, BACON GRABBERS, and TWO TARS, as well as the 1965 compilation film LAUREL & HARDY'S LAUGHING 20's. Steve Bailey examines the supporting roles that horses play in several Laurel & Hardy comedies. Also, a word about Laurel & Hardy film preservation. A short tribute to Anita Garvin's wonderful supporting performance in this Laurel & Hardy silent comedy. Steve Bailey lists the many film and audio clips of Laurel & Hardy that can be found on YouTube. Episode 33: The story behind "Another nice mess"
Steve Bailey tells the origin story of Oliver Hardy's famous catchphrase. Episode 32: Laurel & Hardy's "animal trilogy"
Steve Bailey examines Laurel & Hardy's final silent short ANGORA LOVE, as well as the sound shorts LAUGHING GRAVY and THE CHIMP. Steve Bailey reviews Laurel & Hardy's silent short subjects THEIR PURPLE MOMENT and THAT'S MY WIFE. Steve Bailey reviews a new novel based on the life of Stan Laurel. Episode 28: Walter Long Day! Steve Bailey examines two Laurel & Hardy short subjects featuring the villainous Walter Long: ANY OLD PORT and GOING BYE-BYE! For Memorial Day 2018, Steve Bailey examines the first feature film that Laurel & Hardy did for Twentieth Century-Fox. Steve Bailey examines Ollie's intended nuptials in the short subjects OUR WIFE and ME AND MY PAL. Episode 23: Laurel and Hardy at last! After appearing in several early films together but not as a team, the Laurel & Hardy we love finally surfaced in the silent shorts THE SECOND HUNDRED YEARS and DO DETECTIVES THINK? Steve Bailey examines both of these movies. Steve Bailey examines Laurel & Hardy 's silent short DUCK SOUP and its talkie remake, ANOTHER FINE MESS. SPOILER ALERT! Steve Bailey documents 24 "freak endings" to Laurel & Hardy films. Steve Bailey examines Laurel & Hardy's first two feature films, PARDON US and PACK UP YOUR TROUBLES. Steve Bailey discusses Laurel & Hardy radio shows and Stan Laurel interviews that are available for free listening on YouTube. Episode 16: Unclean, unclean, unclean! Steve Bailey examines the somewhat sordid storylines of Laurel & Hardy's short subjects COME CLEAN and THE LIVE GHOST. Episode 15: An overview of SHOULD MARRIED MEN GO HOME? Overviews of Laurel & Hardy's short subject COUNTY HOSPITAL and their Twentieth Century-Fox feature film THE DANCING MASTERS. Steve Bailey examines an early, atypical L&H silent short that was for years (strangely) regarded as the first "official" Laurel & Hardy movie. Steve Bailey discusses the Laurel & Hardy short subjects THE LAUREL-HARDY MURDER CASE, HABEAS CORPUS, and OLIVER THE EIGHTH. Steve Bailey critiques the silent L&H short DOUBLE WHOOPEE and their talkie BE BIG! Steve Bailey examines the hostile wives of Stan and Ollie in WE FAW DOWN, BLOTTO, and CHICKENS COME HOME. Steve Bailey gives an overview of Laurel & Hardy's silent short subjects THE LUCKY DOG and THE TREE IN A TEST TUBE. Be warned: This episode is as PC as this podcast will ever get, as Steve Bailey examines the shotgun-wielding wives of L&H movies. At the start of their team career, Laurel & Hardy made movies in which they starred together, but not as a team. Confused? This podcast will help you grasp the situation. L&H short subjects discussed on this podcast are 45 MINUTES FROM HOLLYWOOD, SLIPPING WIVES, LOVE 'EM AND WEEP, WHY GIRLS LOVE SAILORS, WITH LOVE AND HISSES, SUGAR DADDIES, SAILORS BEWARE, and NOW I'LL TELL ONE. Ranked from most readily available to most obscure, and from best to worst. 30-second promo of the podcast.